Being the third under the Sovereign Pontiff, Julius III., celebrated on the eleventh day of October, MDLI. The sacred and holy, oecumenical and general Synod of Trent,-lawfully assembled in the Holy Ghost, the same Legate, and nuncios of the Apostolic See presiding therein, although the end for which It assembled, not without the special guidance and governance of the Holy Ghost, was, that It might set forth the true and ancient doctrine touching faith and the sacraments, and might apply a remedy to all the heresies, and the other most grievous troubles with which the Church of God is now miserably agitated, and rent into many and various parts; yet, even from the outset, this especially has been the object of Its desires, that It might pluck up by the roots those tares of execrable errors and schisms, with which the enemy hath, in these our calamitous times, oversown the doctrine of the faith, in the use and worship of the sacred and holy Eucharist, which our Saviour, notwithstanding, left in His Church as a symbol of that unity and charity, with which He would fain have all Christians be mentally joined and united together. Wherefore, this sacred and holy Synod delivering here, on this venerable and divine sacrament of the Eucharist, that sound and genuine doctrine, which the Catholic Church,-instructed by our Lord Jesus Christ Himself, and by His apostles, and taught by the Holy Ghost, who day by day brings to her mind all truth, has always retained, and will preserve even to the end of the world, forbids all the faithful of Christ, to presume to believe, teach, or preach henceforth concerning the holy Eucharist, otherwise than as is explained and defined in this present decree. In the first place, the holy Synod teaches, and openly and simply professes, that, in the august sacrament of the holy Eucharist, after the consecration of the bread and wine, our Lord Jesus Christ, true God and man, is truly, really, and substantially contained under the species of those sensible things. For neither are these things mutually repugnant,-that our Saviour Himself always sitteth at the right hand of the Father in heaven, according to the natural mode of existing, and that, nevertheless, He be, in many other places, sacramentally present to us in his own substance, by a manner of existing, which, though we can scarcely express it in words, yet can we, by the understanding illuminated by faith, conceive, and we ought most firmly to believe, to be possible unto God: for thus all our forefathers, as many as were in the true Church of Christ, who have treated of this most holy Sacrament, have most openly professed, that our Redeemer instituted this so admirable a sacrament at the last supper, when, after the blessing of the bread and wine, He testified, in express and clear words, that He gave them His own very Body, and His own Blood; words which,-recorded by the holy Evangelists, and afterwards repeated by Saint Paul, whereas they carry with them that proper and most manifest meaning in which they were understood by the Fathers,-it is indeed a crime the most unworthy that they should be wrested, by certain contentions and wicked men, to fictitious and imaginary tropes, whereby the verity of the flesh and blood of Christ is denied, contrary to the universal sense of the Church, which, as the pillar and ground of truth, has detested, as satanical, these inventions devised by impious men; she recognising, with a mind ever grateful and unforgetting, this most excellent benefit of Christ. On the reason of the Institution of this most holy Sacrament. Wherefore, our Saviour, when about to depart out of this world to the Father, instituted this Sacrament, in which He poured forth as it were the riches of His divine love towards man, making a remembrance of his wonderful works; and He commanded us, in the participation thereof, to venerate His memory, and to show forth his death until He come to judge the world. And He would also that this sacrement should be received as the spiritual food of souls, whereby may be fed and strengthened those who live with His life who said, He that eateth me, the same also shall live by me; and as an antidote, whereby we may be freed from daily faults, and be preserved from mortal sins. He would, furthermore, have it be a pledge of our glory to come, and everlasting happiness, and thus be a symbol of that one body whereof He is the head, and to which He would fain have us as members be united by the closest bond of faith, hope, and charity, that we might all speak the same things, and there might be no schisms amongst us. On the excellency of the most holy Eucharist over the rest of the Sacraments. The most holy Eucharist has indeed this in common with the rest of the sacraments, that it is a symbol of a sacred thing, and is a visible form of an invisible grace; but there is found in the Eucharist this excellent and peculiar thing, that the other sacraments have then first the power of sanctifying when one uses them, whereas in the Eucharist, before being used, there is the Author Himself of sanctity. For the apostles had not as yet received the Eucharist from the hand of the Lord, when nevertheless Himself affirmed with truth that to be His own body which He presented (to them). And this faith has ever been in the Church of God, that, immediately after the consecration, the veritable Body of our Lord, and His veritable Blood, together with His soul and divinity, are under the species of bread and wine; but the Body indeed under the species of bread, and the Blood under the species of wine, by the force of the words; but the body itself under the species of wine, and the blood under the species of bread, and the soul under both, by the force of that natural connexion and concomitancy whereby the parts of Christ our Lord, who hath now risen from the dead, to die no more, are united together; and the divinity, furthermore, on account of the admirable hypostatical union thereof with His body and soul. Wherefore it is most true, that as much is contained under either species as under both; for Christ whole and entire is under the species of bread, and under any part whatsoever of that species; likewise the whole (Christ) is under the species of wine, and under the parts thereof. On the cult and veneration to be shown to this most holy Sacrament. Wherefore, there is no room left for doubt, that all the faithful of Christ may, according to the custom ever received in the Catholic Church, render in veneration the worship of latria, which is due to the true God, to this most holy sacrament. For not therefore is it the less to be adored on this account, that it was instituted by Christ, the Lord, in order to be received: for we believe that same God to be present therein, of whom the eternal Father, when introducing him into the world, says; And let all the angels of God adore him; whom the Magi falling down, adored; who, in fine, as the Scripture testifies, was adored by the apostles in Galilee. On reserving the Sacrament of the sacred Eucharist, and bearing it to the Sick. The custom of reserving the holy Eucharist in the sacrarium is so ancient, that even the age of the Council of Nicaea recognised that usage. 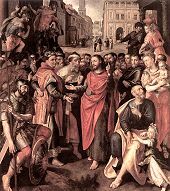 Moreover, as to carrying the sacred Eucharist itself to the sick, and carefully reserving it for this purpose in churches, besides that it is exceedingly conformable to equity and reason, it is also found enjoined in numerous councils, and is a very ancient observance of the Catholic Church. Wherefore, this holy Synod ordains, that this salutary and necessary custom is to be by all means retained. On the preparation to be given that one may worthily receive the sacred Eucharist. If it is unbeseeming for any one to approach to any of the sacred functions, unless he approach holily; assuredly, the more the holiness and divinity of this heavenly sacrament are understood by a Christian, the more diligently ought he to give heed that he approach not to receive it but with great reverence and holiness, especially as we read in the Apostle those words full of terror; He that eateth and drinketh unworthily, eateth and drinketh judgment to himself. Wherefore, he who would communicate, ought to recall to mind the precept of the Apostle; Let a man prove himself. Now ecclesiastical usage declares that necessary proof to be, that no one, conscious to himself of mortal sin, how contrite soever he may seem to himself, ought to approach to the sacred Eucharist without previous sacramental confession. This the holy Synod hath decreed is to be invariably observed by all Christians, even by those priests on whom it may be incumbent by their office to celebrate, provided the opportunity of a confessor do not fail them; but if, in an urgent necessity, a priest should celebrate without previous confession, let him confess as soon as possible. On the use of this admirable Sacrament. Now as to the use of this holy sacrament, our Fathers have rightly and wisely distinguished three ways of receiving it. For they have taught that some receive it sacramentally only, to wit sinners: others spiritually only, those to wit who eating in desire that heavenly bread which is set before them, are, by a lively faith which worketh by charity, made sensible of the fruit and usefulness thereof: whereas the third (class) receive it both sacramentally and spiritually, and these are they who so prove and prepare themselves beforehand, as to approach to this divine table clothed with the wedding garment. Now as to the reception of the sacrament, it was always the custom in the Church of God, that laymen should receive the communion from priests; but that priests when celebrating should communicate themselves; which custom, as coming down from an apostolical tradition, ought with justice and reason to be retained. And finally this holy Synod with true fatherly affection admonishes, exhorts, begs, and beseeches, through the bowels of the mercy of our God, that all and each of those who bear the Christian name would now at length agree and be of one mind in this sign of unity, in this bond of charity, in this symbol of concord; and that mindful of the so great majesty, and the so exceeding love of our Lord Jesus Christ, who gave His own beloved soul as the price of our salvation, and gave us His own flesh to eat, they would believe and venerate these sacred mysteries of His body and blood with such constancy and firmness of faith, with such devotion of soul, with such piety and worship as to be able frequently to receive that supersubstantial bread, and that it may be to them truly the life of the soul, and the perpetual health of their mind; that being invigorated by the strength thereof, they may, after the journeying of this miserable pilgrimage, be able to arrive at their heavenly country, there to eat, without any veil, that same bread of angels which they now eat under the sacred veils. But forasmuch as it is not enough to declare the truth, if errors be not laid bare and repudiated, it hath seemed good to the holy Synod to subjoin these canons, that all, -the Catholic doctrine being already recognised,-may now also understand what are the heresies which they ought to guard against and avoid. CANON IX.-If any one denieth, that all and each of Christ's faithful of both sexes are bound, when they have attained to years of discretion, to communicate every year, at least at Easter, in accordance with the precept of holy Mother Church; let him be anathema. CANON X.-If any one saith, that it is not lawful for the celebrating priest to communicate himself; let him be anathema. CANON XI.-lf any one saith, that faith alone is a sufficient preparation for receiving the sacrament of the most holy Eucharist; let him be anathema. And for fear lest so great a sacrament may be received unworthily, and so unto death and condemnation, this holy Synod ordains and declares, that sacramental confession, when a confessor may be had, is of necessity to be made beforehand, by those whose conscience is burthened with mortal sin, how contrite even soever they may think themselves. But if any one shall presume to teach, preach, or obstinately to assert, or even in public disputation to defend the contrary, he shall be thereupon excommunicated. Bishops shall apply themselves with prudence to reform the manners of their subjects: from the correction of those bishops there shall be appeal. The same sacred and holy Synod,-lawfully assembled in the Holy Ghost, the same legate and nuncios of the Apostolic See presiding therein,-purposing to ordain certain things which relate to the jurisdiction of bishops, in order that they may, in accordance with the decree of the last Session, so much the more willingly reside in the churches committed to them, by how much they shall be able, with greater ease and convenience, to rule and to keep in propriety of life and conversation those subject to them, thinks it meet that the bishops be first of all admonished to bear in mind, that they are pastors and not strikers, and that they ought so to preside over those subject to them, as not to lord it over them, but to love them as sons and brethren; and to strive, by exhortation and admonition, to deter them from what is unlawful, that they may not be obliged, should they transgress, to coerce them by due punishments. Towards whom, however, should they happen to sin in any manner through human frailty, that injunction of the apostle is by bishops to be observed, that they reprove, entreat, rebuke them in all kindness and doctrine; seeing that benevolence towards those to be corrected often effects more than austerity; exhortation more than menace; charity more than power. But if, on account of the grievousness of the transgression, there be need of the rod, then is rigour to be tempered with gentleness, judgment with mercy, severity with lenit; that so discipline, so salutary and necessary for the people, may be preserved without harshness; and they who are chastened may be amended, or, if they will not repent, that others, by the wholesome example of their punishment, may be deterred from vices; since it is the office of a pastor, at once vigilant and kind, to apply first of all gentle fomentations to the disorders of his sheep, and afterwards to proceed to sharper and more violent remedies, when the grievousness of the distempers may require them; but if not even these are effectual in removing those disorders, then is he to free the other sheep at least from the danger of contagion. Whereas, therefore, those guilty of crimes, ordinarily, in order to avoid punishment, and to evade the judgments of their bishops, affect to have subjects of complaint and grievances, and, under the subterfuge of an appeal, impede the process of the judge, (this Synod) in order to prevent a remedy which was instituted for the protection of innocence, from being abused to the defence of wickedness, and that this their craft and tergiversation may be met, hath ordained and decreed that: In causes relative to visitation and correction, or to competency or incompetency, as also in criminal causes, there shall be no appeal, before the definitive sentence, from the bishop or his vicar general in spirituals, against any interlocutory sentence, or other (alleged) grievance, whatsoever; neither shall the bishop, nor his vicar, be bound to defer to any such appeal, as being frivolous; but they may proceed to ulterior measures, that appeal, or any inhibition whatsoever emanating from a judge of appeal, as also every usage and custom even immemorial, to the contrary notwithstanding; except it be that the said grievance cannot be repaired by the definitive sentence, or that there is no appeal from the said definitive sentence; in which cases the statutes of the ancient canons shall remain untouched. An appeal from the bishop in criminal causes, when to be committed to the Metropolitan, or to one of the nearest bishops. A case of appeal-where there is room for such appeal-from the sentence of the bishop, or that of his vicar general, shall, if it happen to be a case committed by apostolic authority to judges on the spot, be referred to the metropolitan, or even to his vicar general in spirituals; or if that metropolitan be for some cause suspected, or be distant more than two days' journey as settled by law, or if it be from him that the appeal is made, the case shall be committed to one of the nearest bishops, or to the vicars thereof, but not to inferior judges. The acts of the first instance shall, within thirty days, be given gratuitously to the accused appellant. The accused who is in a criminal cause an appellant from the bishop, or from his vicar general in spirituals, shall absolutely produce, before the judge to whom he has appealed, the acts of the first instance; and the judge shall by no means proceed, without having seen them, to the absolution of the accused. And he, from whom the appeal is made, shall furnish on the demand (of the appellant), the said acts gratuitously within thirty days; otherwise the said case of appeal shall be terminated without them, in the way that justice may require. In what manner clerics are, on account of grievous crimes, to be degraded from sacred Orders. And whereas crimes so grievous are sometimes committed by ecclesiastics, that, on account of the atrocity thereof, they have to be deposed from sacred orders, and delivered over to a secular court; in which case a certain number of bishops is, according to the Canons, required; and whereas, should there be a difficulty in assembling them all, the due execution of the law would be retarded; whilst, should they on any occasion be able to be present, their residence would be interrupted; therefore hath the Synod resolved and decreed, that it shall be lawful for a bishop, by himself or by his vicar general in spirituals, without the presence even of other bishops, to proceed against a cleric, even against one who is raised to the sacred order of the priesthood, even to his condemnation, as also to his verbal deposition; and he shall be able by himself to proceed even to actual and solemn degradation from the said ecclesiastical orders and degrees, in the cases wherein the presence of other bishops, in a specific number, is required by the Canons; taking, however, to himself, and being assisted therein by, a like number of abbots, who have the right of using the mitre and crosier by apostolic privilege, if so be that they can be found in the city, or diocese, and can conveniently be present; or in their default, (being assisted) by (a like number of) others persons constituted in ecclesiastical dignity, who are of weight by their age and recommended by their knowledge of law. The bishop shall take summary cognizance of graces whereby a sin, or a punishment, is remitted. And because it sometimes happens that, under false pleas, which notwithstanding seem probable enough, certain persons fraudulently obtain graces, whereby the punishments inflicted on them by the just severity of their bishops are either wholly remitted, or are mitigated; and whereas it is a thing not to be borne, that a lie, which is so exceedingly displeasing to God, should not only itself go unpunished, but even obtain for him that tells it, the pardon of another crime; the Synod hath for this cause ordained and decreed as follows: That a bishop, resident in his own church, shall of himself, as the delegate of the Apostolic See, take cognizance even summarily of the surreption or obreption of any grace, obtained under false pretences, for the absolution of any public crime or delinquency, into which he himself had instituted an inquiry; or for the remission of a punishment to which he has himself condemned the criminal; and he shall not admit the said grace, after that it shall have been lawfully ascertained, that it was obtained by the statement of what is false, or by the suppression of the truth. A bishop shall not be personally cited, save in a case involving deposition, or deprivation. And whereas the subjects of a bishop, even though they have been justly chastened, do often nevertheless bear him a violent hatred, and, as if they had suffered some wrong at his hands, object false accusations against him, in order that they may annoy him by whatsoever means lie in their power,-the fear which annoyance doth for the most part render the bishop more backward in inquiring into and punishing delinquencies; therefore, that a bishop may not be compelled-both to his own great inconvenience and that of his Church-to abandon the flock entrusted to him, and that he may not be forced-not without the diminution of the episcopal dignity-to wander from place to place, (the Synod) hath thus ordained and decreed: That a bishop, even though he be proceeded against ex officio, or by way of inquiry, or denunciation, or accusation, or in any other way whatsoever, shall not be cited or warned to appear in person, except for a cause for which he might have to be deposed from, or deprived of, his office. The qualifications of witnesses against a bishop are described. In a criminal cause, witnesses shall not be received against a bishop, whether as to the information, or proofs, or other process affecting the principal point of the case, unless their testimony agree, and they be of a good life, in good esteem and reputation; and if they shall have made any deposition through hatred, rashness, or interest, they shall be subjected to grievous punishments. Important episcopal causes shall be taken cognizance of by the Supreme Pontiff. The causes of bishops, when, on account of the quality of the crime objected, they have to appear (in person), shall be carried before the Sovereign Pontiff, and be by him decided. The same holy Synod,-desiring to pluck out of the field of the Lord all the errors which like thorns have sprung up again on the subject of this most holy sacrament, and wishing to provide for the salvation of all the faithful, her daily prayers being devoutly offered up to Almighty God for this end,-amongst the other articles, relative to this sacrament, which have been treated of with the most diligent inquiry into Catholic truth; very many and most accurate conferences, according to the importance of the matters, having been held, and the sentiments also of the most eminent theologians having been ascertained; has likewise treated of these following: whether it be necessary to salvation, and be prescribed of divine right, that all the faithful of Christ receive the said venerable sacrament under both species. And; whether he who communicates under either species receive less than he who communicates under both. And; whether holy Mother Church hath erred, by communicating, under the species of bread only, the laity, and priests when not celebrating. And; whether little children also are to be communicated. But whereas those, of the most noble province of Germany, who call themselves Protestants, desire to be heard by the holy Synod upon these said articles before they are defined, and for this end have asked for the public faith from the Synod, that they may be allowed to come hither in safety, dwell in this city, speak freely and set forth their sentiments before the Synod, and afterwards depart when they please; this holy Synod,-although It has looked forward with great earnestness for many months past for their coming, nevertheless, as an affectionate mother that groaneth and travaileth, most ardently desiring and labouring after this, that, amongst those who bear the Christian name, there may be no schisms, but that, even as all acknowledge the same God and Redeemer, so may all say the same thing, believe the same, think the same,-trusting in the mercy of God, and hoping that the result will be that they may be brought back to the most holy and salutary concord of one faith, hope, and charity, (and) yielding to them herein, hath, as far as the said Synod is concerned, given and granted, according to their request; a public assurance and faith, which they call a safe-conduct, of the tenor which will be set down below; and for their sakes It hath postponed the definition of those articles to the second next Session, which, that they may conveniently be present thereat, It hath indicted for the festival of the conversion of Saint Paul, which will be on the twenty-fifth day of the month of January of the ensuing year. And It furthermore ordains, that the sacrifice of the mass, on account of the close connexion between the two subjects, shall be treated of in the same Session; and that meanwhile It will treat of the sacraments of Penance and Extreme Unction in the next Session, which It hath decreed is to be held on the festival of Saint Catharine, virgin and martyr, which will be the twenty-fifth of November; and that at the same time, in both Sessions, the matter of reformation shall be proceeded with. The sacred and holy, general Synod of Trent,-lawfully assembled in the Holy Ghost, the same Legate and Nuncios of the holy Apostolic See presiding therein,-grants, as far as regards the holy Synod itself, to all and each one throughout the whole of Germany, whether ecclesiastics or Seculars, of whatsoever degree, estate, condition, quality they be, who may wish to repair to this oecumenical and general Council, the public faith and full security, which they call a safe-conduct, with all and each of the necessary and suitable clauses and decrees, even though they ought to be expressed specifically and not in general terms, and which it is Its wish shall be considered as expressed, so as that they may and shall have it in their power in all liberty to confer, make proposals, and treat on those things which are to be treated of in the said Synod; to come freely and safely to the said oecumenical Council, and there remain and abide, and propose therein, as well in writing as by word of mouth, as many articles as to them shall seem good, and to confer and dispute, without any abuse or contumely, with the Fathers, or with those who may have been selected by the said holy Synod; as also to withdraw whensoever they shall think fit. It hath furthermore seemed good to the holy Synod, that if, for their greater liberty and security, they desire that certain judges be deputed on their behalf, in regard of crimes whether committed, or that may be committed, by them, they shall themselves nominate those who are favourable towards them, even though the said crimes should be ever so enormous and should savour of heresy.